No worries if you ordered from me shortly before this time-frame. All orders received on April 19th will be created and shipped promptly. :) If you have any questions, let me know and I will reply to you when I return. Thank you! 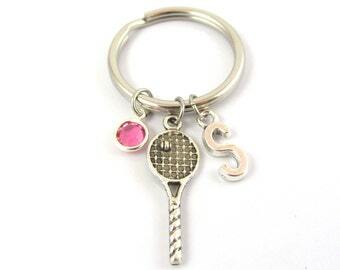 Creating 16 tennis keychains... love the beautiful birthstones! Personalized keychains with a splash of shimmering color. Durable and beautiful, all in one. A perfect personal gift! I love my job! I love using beautiful Swarovski crystal element beads combined with adorable charms in my creations. I love the beautiful crystal birthstones that shimmer in the light. There are a variety of charms to choose from to suit any lady's hobbies and interests. Many of the items can be personalized and there are a variety of bracelet sizes and necklace lengths so as to accommodate everyone. My goal is to create beautiful, durable jewelry and accessories that will bring enjoyment to every day life. I have been a creative person my entire life. I am a musician (piano) and I love animals, thus you will often see these themes reflected in my designs. I love being creative and using the creative gifts that God has given me. Let me know if you have any questions and thank you for visiting Bead Brilliant! Our handcrafted jewelry and accessories are designed to be fun, durable, and imaginative. Our unique designs feature shimmering Swarovski birthstone crystals and adorable charms. All items are handcrafted with care and precision at the home studio in Texas. Bead Brilliant focuses on high quality items, fast shop processing time, and great customer service. Please reach out if you have any questions. Current processing time before items are shipped: 1-3 business days. Business days are Monday - Friday. -OR- you can upgrade to USPS Priority Mail or USPS Priority Mail Express. Shipping is available to many countries outside of the United States via USPS First Class International Mail. See our policies for full information regarding shipping. -I take great pride in my work and always double check orders before they are mailed. If you think there may be an error with your order, please contact me with a picture of the item so I can help resolve any issues. A picture of the item allows me to confirm that you did purchase from my shop, Bead Brilliant, and to observe any possible issues with the item. My customers are very important to me and I want you to be happy with your purchase. -If you have any questions or concerns, please contact me on here, via ETSY CONVERSATION. This is the easiest and most direct way to contact me. Go to the main shop page and see on the left side where it says, "Have a question? Contact the shop owner." and click that to create and send a message to me. You can also email me at beadbrilliant [!at] gmail.com, but please send an etsy convo/message as well. I always respond as soon as possible and I care greatly about receiving feedback from my customers. If you do not receive a reply in 24 hours, please send me another message. Very rarely a message may not get through due to technical difficulties on etsy's part. -Due to the nature of original custom work, a 50% refund is available per item (excluding shipping costs). If you want to return an item, please send me a message to inquire about returning the item. Items may be returned within 30 days of receiving it if it is still in original condition. Buyer is responsible for return shipping. Once the item is received, a refund will be issued, minus the original shipping cost. -Due to the nature of personalized and customized products, any items that have been created and packaged (but not mailed) before cancellation is submitted by buyer will be subject to a restocking fee that covers the materials consumed in the project, time spent on creating the item(s), and packaging materials consumed. Orders cannot be cancelled once they are shipped. Payment is accepted via credit card, etsy gift card, or paypal. To use paypal, you don't need to have a PayPal account; you can proceed as a guest and pay with your credit card. Texas residents will have sales tax applied to the order. I do not accept e-checks through paypal. All orders with e-checks will be cancelled. Custom orders require payment before the item is created. After payment, the project will be created. After project creation a picture of the item will be shared with the buyer to approve before shipping. Please feel free to read all of the following applicable information directly below as it will help you to know what to expect regarding shipment. Business days are Monday through Friday. Packages are mailed Monday through Friday. Please double check your mailing address before submitting your order. This will ensure that it is correct and that your order will get to you. SHOP PROCESSING TIME: Currently 1-2 business days for the item to be reached in our order queue and be created by hand ***BEFORE*** shipping. Thank you for the opportunity to make you special jewelry and accessories! = ESTIMATED DAYS TO DELIVERY. United States Postal Service does not give an estimate on first class international packages. So if you live outside of the United States, the closest estimate we can give based on watching previous packages make it to our customers is anywhere from 7 business days to 6 weeks. It varies by country. --Each item is mailed in a small plastic bag, wrapped in bubble wrap, inside of a pretty organza bag. We do not offer gift box options at this time. A business card is included. No printed receipts are included as it is available through your etsy account. -USPS First Class Mail: The shop processing time is 1-2 business days after ordering, in which the item will be created by hand and then prepared for shipment. Shipping itself normally takes 2-7 business days, beginning the day after the package is accepted by USPS. Occasionally a package can be delayed; USPS does not guarantee this time frame, but the majority of the time they are reliable and follow through on this given time range. -USPS Priority Mail: The shop processing time is 1-2 business days after ordering, in which the item will be created by hand and then prepared for shipment. Shipping itself normally takes 2-3 business days, beginning the day after the package is accepted by USPS. Occasionally a package can be delayed; USPS does not guarantee this time frame, but the majority of the time they are reliable and follow through on this given time range. -USPS Priority Mail Express: The shop processing time is 1-2 business days after ordering, in which the item will be created by hand and then prepared for shipment. Shipping itself normally takes 1-2 business days, beginning the day after the package is accepted by USPS. Occasionally a package can be delayed; USPS *does* guarantee this time frame, so if they are unable to complete the delivery in the given time frame, we can submit a form for a refund. -- I do not accept orders from the following countries: the Philippines, Mexico, China, Argentina, and a few others at seller's discretion. Please send a message with any questions. Orders will be cancelled from these countries. Unfortunately, it is not secure to ship to these countries, so I cannot accept orders from them. -USPS First Class International Mail: The shop processing time is 1-2 business days after ordering, in which the item will be created by hand and then prepared for shipment. Shipping then typically takes anywhere from 1-6 weeks; how long depends on the country and customs process. USPS does *not* give an estimated delivery date or guarantee of when it will be delivered. The buyer is responsible for any and all custom fees. Please note that shipping to some countries (we are located in the United States) may take up to 6 weeks. It depends heavily on the customs procedure in that country. CUSTOM FEES: As stated above, the buyer is responsible for any and all custom fees. Please note that all international buyers (outside of the United States) are subject to custom fees on packages instated by their own country. Bead Brilliant has no information on customs time frames or charges, does not collect any fees associated with it, nor has any power over these charges. --Please note that occasionally USPS can have unusual delays due to weather or other unforeseen circumstances which may cause your package to be delayed. International shipping can take up to 6 weeks so please wait patiently with us as the postal services get your package to you. Feel free to contact us with any questions and we will help you as much as possible with tracking. We will make sure you receive your item. -- For packages within the United States: Please note that USPS gives ESTIMATED delivery times, but USPS does *not* guarantee first class or priority mail by a specific date. USPS is normally good about delivering packages in their given time frames, but on occasion it can take longer. As such, seller cannot guarantee estimated delivery dates. If a delay occurs, please be in contact directly with us about the item so we can help in conversing with USPS about any delays. USPS does guarantee priority mail express. If the package is not delivered in the given time range (2 business days) then please contact us so we can submit a form to USPS to petition a refund. --It often takes at least 24 hours to display tracking information on your package after it is put in the mail; sometimes longer than that. Rest assured knowing that once a package is marked as shipped then it is on its way to you. USPS does not always scan packages at every location. For U.S. shipments: If in the rare case your package does not arrive within a week of the specified shipping frame given here, please send a message and a case may be opened with USPS to investigate. Please be assured that you will be helped if you have any questions regarding your package. -Bead Brilliant will mail the package to the address given by the buyer. If there are any errors detected by USPS before the item is mailed, the seller will contact you to verify your address. This may delay shipment as we await a reply from you. Please note that the seller is not responsible for an incorrect or outdated address given by the buyer at checkout. -Processing time may be extended or orders cancelled if we do not have all pertinent information for personalized and custom items. Customer will be contacted via etsy message and email to retrieve all information to fulfill an order. If we do not hear back within an appropriate time frame about the length or size of an item, the item will be created the standard size for that particular item. If there is an issue such as a shipping address error and there is no response from buyer on how to correct said issue, the order may be cancelled. I truly love my work and my customers. You are very important to me. You help make what I do - designing and creating jewelry and accessories - a joy and a blessing. I love my work and my customers and I hope it shows in every part of your shopping experience! -Each item is mailed in a small organza bag. We do not offer gift boxes at this time. I wrap all items in bubble wrap and mail them in a bubble mailer which helps protect the item. -It is important to keep silver plated jewelry from becoming wet as that may cause fading or tarnishing. Do not wear while showering, bathing, swimming, or any other situation where your jewelry may get soaked. Seller reserves the right to refuse service for any reason.